Factory Floor deliver relentless dance floor brutality during EVOL’s birthday party at the Kazimier, Getintothis’ Mike Townsend reports on a band who are changing the future of live music. It’s quite strange in a way; with such an intricate and experimental sound, you’d imagine Factory Floor to be one of those bands who spend years in the studio, losing their minds in workstation software and eating takeaways on top of mixing desks. 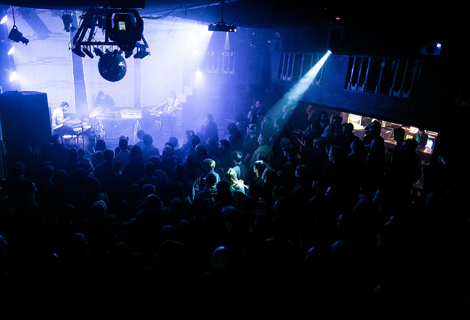 When Getintothis interviewed them last week though, synth man Dominic Butler suggested that their sound is almost entirely visualized from their gigs and shows. From the earliest stages of conception, to the development and to the final results – all revolving around how they play these songs live. So tonight’s show at The Kazimier is a chance to see a band not just realizing their sound but defining it as well. Described as a “heart-spinning, utterly exhilarating supernova”, Stolen Recording‘s East India Youth‘s brand of analogue leaning pop is a menacing introduction this evening. Doyle pounds vocals and synths into place during Heaven, How Long and Coastal Reflexions, avoiding specific cues and allowing the parts to occupy their own spaces. And while the early part of the set relies on textured synthetic dissonance trading with rubbery bass guitar and subtle modulations, it’s the last third of which becomes truly glorious as his tighter ‘songs’ give way to extended dancefloor motorik grooves which spin into dazzling abandon. Early 2014, the one-man sonic army, William Doyle will release his debut album Total Strife Forever, on this evidence we can barely wait. 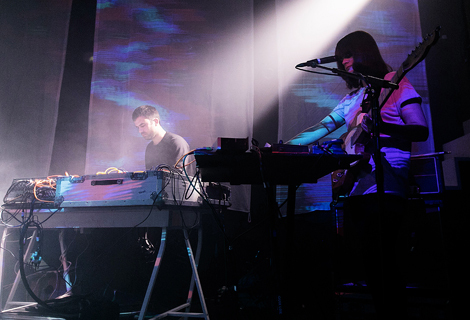 Factory Floor‘s approach to song writing shares similarities with producers of techno and other forms of electronic music, tackling those sort of primal urges that will automatically move your feet for eight straight hours in the middle of night. They are formed almost entirely around rhythm and pulse, with different timbres, textures and the occasional melody following obediently afterwards. There is no set list tonight. I’m not even sure if there are any songs. Factory Floor have conceived a whole performance around a continuous, breathless release. They beat match, segue and introduce new textures patiently, using vague outlines of songs from the album like little signposts. It certainly is an ambitious concept; this notion of treating the gig almost as if it’s a live DJ set, and it will certainly alienate the members of the audience who have found their way here through guitar music. Most though, are here to lose themselves in the kind of brutal and relentlessly forward facing noise that removes you from your surroundings and has you vaguely recalling those tinnitus warnings your dad warned you about. The likes of Fall Back and How You Say are battered and beaten as if they are cars being compressed by an industrial crusher, made faintly recognizable by the tuneless whispers from vocalist Nik Void. It certainly demands a lot from the audience. I mean, this kind of thing is usually made more digestible by the presence of chemicals and some lad chewing your ear off about his philosophy dissertation. Carrying the performance though, like on the album, is Gabriel Gurnsey on drums. I’m not sure when it happened, but between the eerie ambience of early singles like Two Different Ways and Like A Wooden Box, Factory Floor must have got sick of standing still. So with a beat that he has absolutely no right to play live, Gurnsey turns the show almost into a club night, aiming squarely to the dance floor to the point where there is even some guy (after taking a wrong turn on his way to Magaluf) twisting sweatilly in a vest and sunglasses before discovering the meaning of existence. 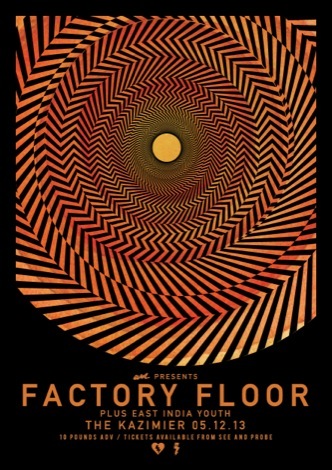 This idea though that they can be the sort of band that plays The Tate the night before playing The Berghain, suggest that Factory Floor are a band with a deep affection for the way we experience live music. Audiences need to be challenged because if otherwise, we’d all be paying six quid to watch Florence and The Machine wail through an internet connection. With this in mind, Factory Floor are developing and changing beyond the confines of a ten-track album every two years. Tonight’s show is memorable not because of what the songs sounded like live but because of what they didn’t sound like, and this is why they are one of the most exciting bands this country has produced in years. 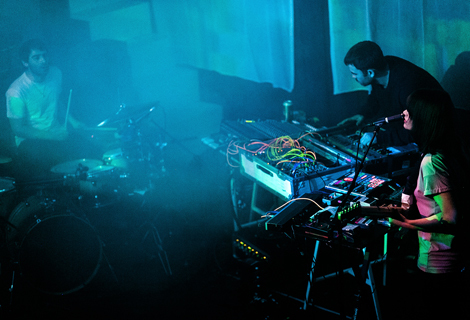 Earlier, Liverpool witnessed a brief snapshot of emerging electronic duo DROHNE, who embodied every inch of their name; a mere whisper of ghost-vocals emerging through a cacophony of treated modulations and nasty keys punches. Balancing a raft of equipment on a stand made from the legs of pink tutu-sporting manikin, DROHNE straddle barely-there ambience with hypnotic stabbing synth grooves. It’s far too early to make a considered call on where they go next, but for now we’ll take solace in another intriguing prospect in Merseyside’s progressive electronic cauldron. 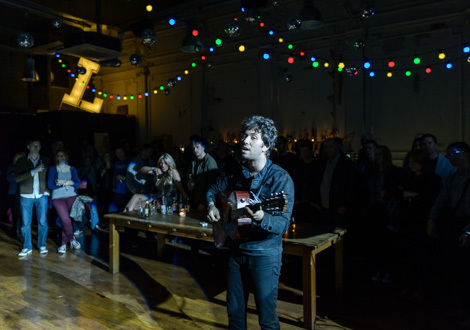 Getintothis talks to Factory Floor. Getintothis on Factory Floor‘s Turn It Up – the first fruits of debut album. 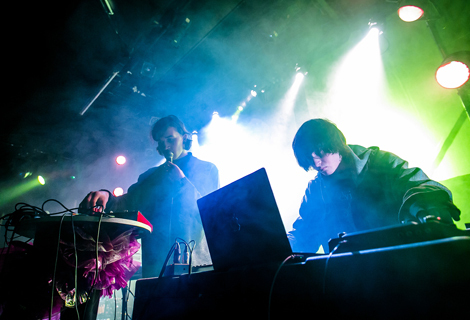 Getintothis on East India Youth: Coastal Reflexions. 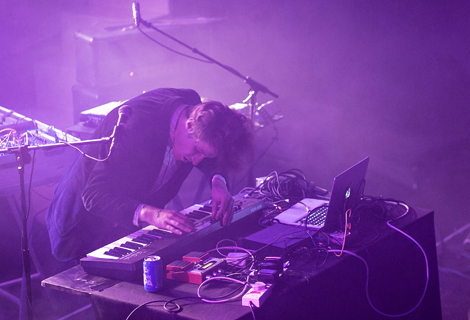 East India Youth‘s Looking For Someone named Getintothis‘ Single of the Week.